It's worth a moment to reflect on last year. A good spawning early May, and then I couldnt get another decent batch of hatchlings for the rest of the year - and I managed to get a partial hatch, from spawning a female for the second time in the same year. This year - it's only mid May and I've had 4 spawnings - 1 failed, 1 produced a modest batch of good eggs but I failed to rear them right, and 2 have produced bumper hatches - I think the number of hatchlings I've had this year may be more than the total number of hatchlings I've had in the first 2 years combined. The okawa female's fry are out in the top fry pond. I estimate at least 100k of them - there were enough to fill both ponds. Advice from Mark at Cuttlebrook in the past was not to overpopulate the fry ponds; but I didnt have time to do a proper count, and felt the least risky option was simply to put them all in. All 100k of them (estimated numbers) went into one fry pond and we'll see how they get on. I may adjust the feeding regime to account for them using up the natural food faster than I'd like. This is a repeat of the July 14 spawning - so all being well (and so much can still go wrong! ), we'll have a decent harvest in around 5 weeks and the opportunity to see if we get the same kind of result quality wise as last year, or whether it's different. Famcy a cuppa? Green water, and kohaku fry mix. Lovely. Step 1: drain down the water. we used a 4k liter per hour pump, placed in the base of the fish basket, and with a 0.5mm hole sized net wrapped around the basket to stop the fry being sucked in. This is the spawning set up I'm going with now. It's the green vortext tank , with spawning ropes suspended from bamboo canes/ Water level is c.1ft below the rim of the tank. Tank depth is 6 foot, made up of 4 foot straight side, 1 foot of narrowing, and then 1 foot at the base which has the bottom drain built in, I placed 10 spawning ropes in the tank for the okawa female kohaku spawning. The green vortext tank is connected up to the growin on tanks - one of which you can see immediately behind the vortext tank in the picture, and the other growing on tank is further back, on the top right of the picture. A reflection on the kohaku spawning - I only reared the eggs that were laid onto the spawning ropes. I left the eggs laid on the sides of the tank - and amazingly, they've also hatched and I have a few thousand little kohaku fry swimming around my green vortex tank! The spawning ropes' eggs produced the largest hatch I've had yet; I think the key was a good fertilisation rate. And then there are so many eggs just on the spawning ropes that they alone have produced more fry then I need. I will be continuing with this new approach for spawnings. ofcourse, the big question mark right now is - are there any shiro's in the other fry pond? 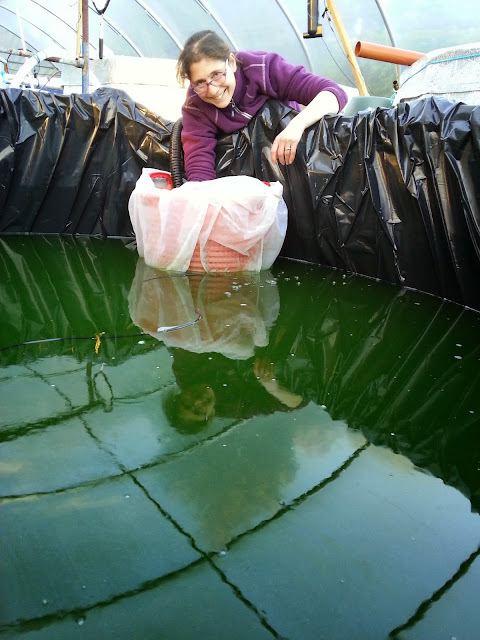 We put in thousands - it was also a good hatch, and I'm sure many 10's of thousands of shiro fry went in. But the number we've been able to see has dwindled over the last week. yet, we've been able to see the sample batch of shiro fry - these were white fry with a little piece of black on them; interestingly, some are developing as black fish, whilst most are developing as white fish. 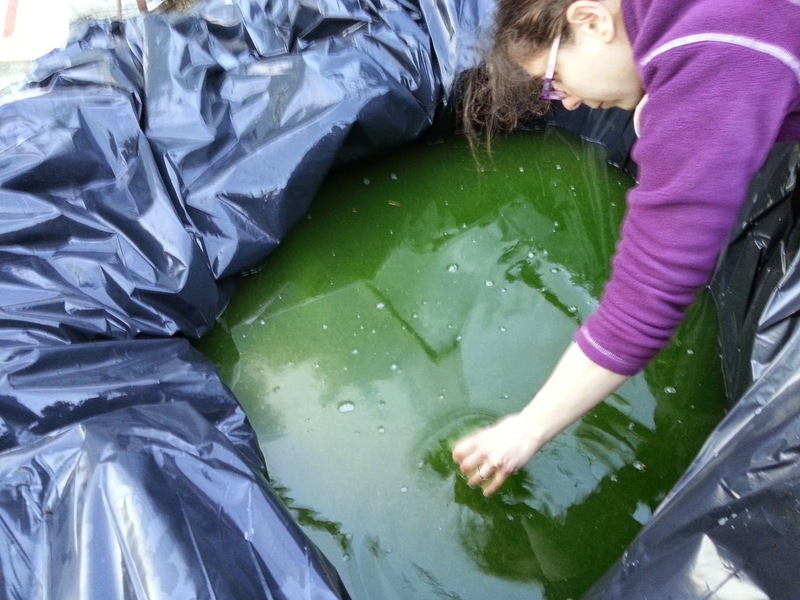 But the key thing is that they have survived; that's around 70 fry in around 4k litres of water. 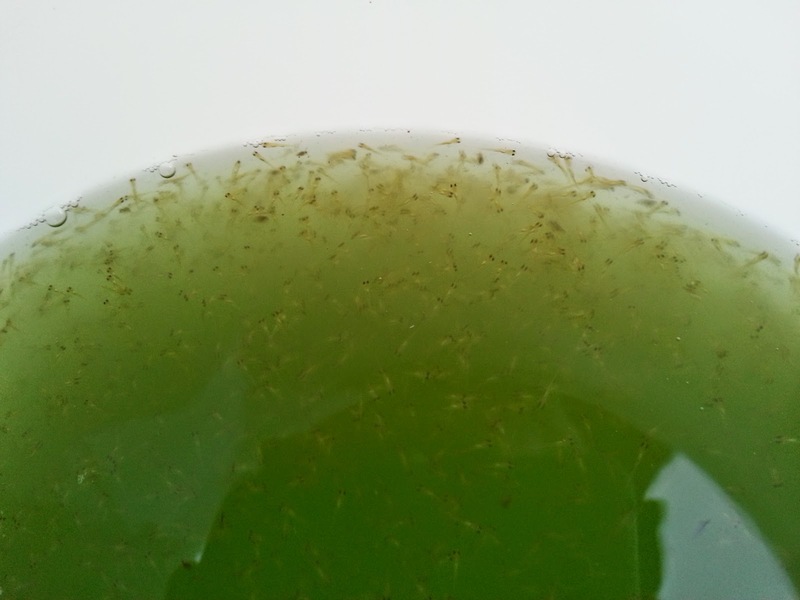 no food, just the zooplankton they can find in the tnak. The water in that tank has been in situ for a year, and there's plenty of wildlife in the tank. So - why can we see fry in the sample tank, but not in the shiro's fry pond? Could it be that something went wrong with the cycling in the fry pond? No enough of the right type of zooplankton for the shiro fry? Could it be that most of the fry in the fry pond are black (we did improve the % black through kuroku), and we simple cant see them because it's like looking for tiny black objects on top of a black liner? This is possible - but I can't help think it's wishful thinking. 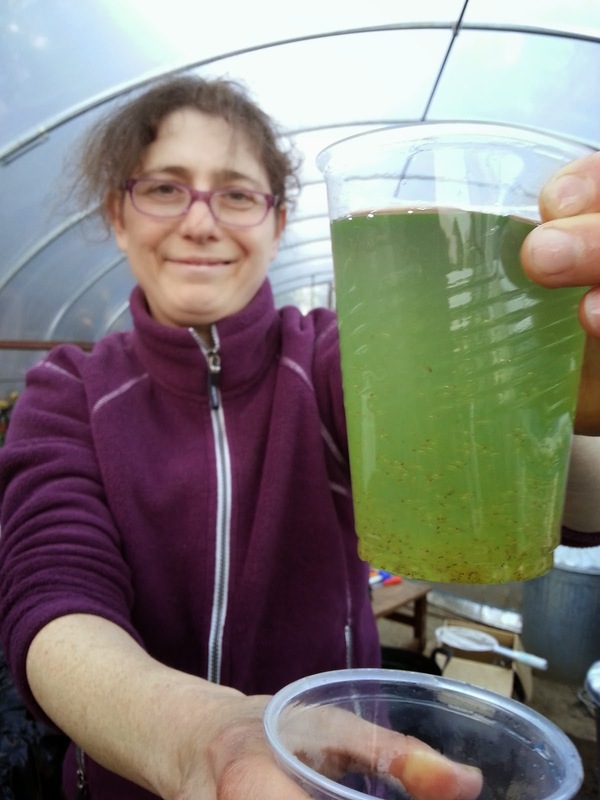 I remember in 2013, I went over to see Mark at Cuttlebrook, and he took me round his fry ponds mid summer and showed me what fry ponds should look like with the right amount of fry in them and examples with fry of different ages. I remember we looked at the pond with his shiro fry, and it was really tough to spot the fry at 2 weeks old, and this is because they're black, and we spoted some in the end on the margin of the pond where the mud was a light brown - so a small black fish visible over a light brown background. If they've gone the way of the dodo - then that will be tough to take, but it doesnt take away from the fact that I have still made a significant step forward in delivering 2 successfull spawnings before mid May... And with this improved spawning approach, maybe I'll have some luck with the showa set that Shintaro put together for us. You remember the female and males Amanda bought back from her visit to Shintaro - a fantastic female, and the full set of 1 female and 3 males put together for us by such an expert. A privaledge, and a big investment for us... but frustratingly, they didnt spawn for us last year... Perhaps this is their year? Also, what are the sizes of your vats/tanks and what are the dimensions of your pond? Hi James. I use two companies for nets; Norfine Nets, and Collins nets. For non- standard nets, like the seine nets and cage nets; best thing is to speak with them and they can advise. Some koi dealers also sell a range of cage nets, and you can find those through a simple internet search. I've typically bought through Koi Logic, and Coastal Koi. If going direct to Norfine or Collins, basically they have some standard off the shelf sizes - and if you need something different they will make to order too. In terms of my tanks there are quite a few of them, and the best place to look is through my blog - I recorded the details of them during the build stage and you can filter the blog posts based on the build topic. I do try and record as much detail as I can in the blog, so it's there for readers to refer to. 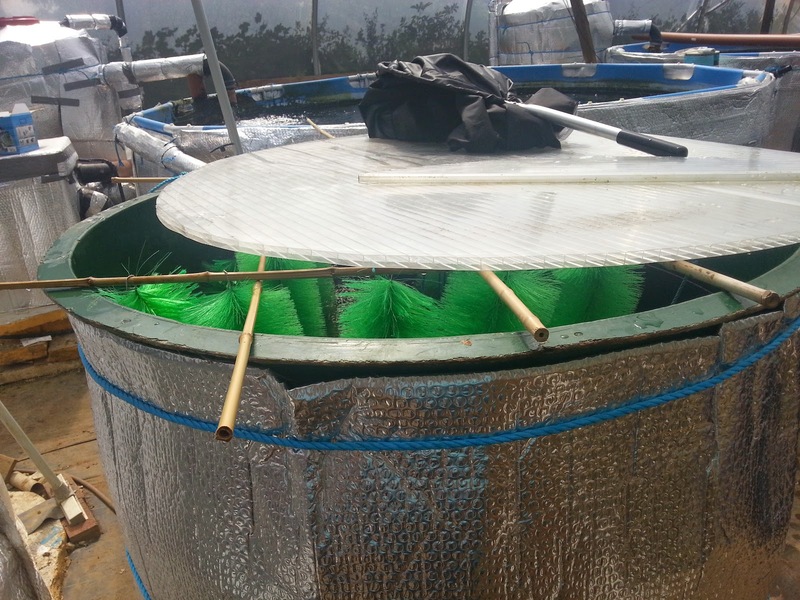 You asked specifically about the growing on vats, and they are 10k litre tanks, 12ft diameter and around 1m water depth. In terms of finding good oyagoi - I'm not sure I'm qualified to answer... I'm still learning myself, and I'd suggest speaking to a professional koi breeder like Mark Davis, or your local specialist koi dealer. But in general, I'm looking for the same kinds of things you would be looking for in a good example of that variety; body, skin, colour. I rely heavily on the advice of the koi dealer I've been buying parent fish from over the last 2 years - Mike Snaden (Yume Koi) Age wise - for a female, I've started with females that are between 3 summers old and 6 summer's old, and males, 2 summers old or older. One thing I've learned with breeding koi, is that you can have fantastic looking parent fish - and they may simply not be good a spawning. Each oyagoi purchase is a bit of a gamble. One way I've heard people get started is to buy a batch of tosai, and grow them on - then select the best ones for spawning, and move on the others. There are lots of ways to get started. Overall, it's extremely rewarding when things go well and I'd recommend having a go. But even with best laid plans, things don't always work out. Expect a steep learning curve. Hope that helps. Thanks Adam, I really appreciate your help, I love what your doing and will use your blog as a reference for the future, all the best, James.